I am remind­ed of Henslowe’s speech in the film ​“Shake­speare in Love” in which he gives his pre­scrip­tion for the­atre; ​“Com­e­dy, Love, and a bit with a dog.” On that scale, Jezebel, at the Still Point scores three out of three. Peo­ple who love their dogs will like­wise love this pro­duc­tion, and even peo­ple who are not dog lovers will prob­a­bly enjoy the performance. The premise of this play is a des­per­ate attempt to pro­long the life of Jezebel, who, like any com­pan­ion ani­mal, faces a much short­er lifes­pan than the aver­age human. 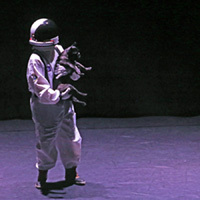 The quest becomes a fan­ci­ful explo­ration of space, time trav­el and cloning in an attempt to pre­serve the lov­ing bond between human and dog. Hill­yard brings a lot of charm and love onto the stage, and this will like­ly win over even those who are not part of the dog-lov­ing crowd (with the pos­si­ble excep­tion of cat lovers), and only the diehard purist would object to break­ing con­ven­tions such as when the astro­naut dances through the wall of imag­i­nary space ship.